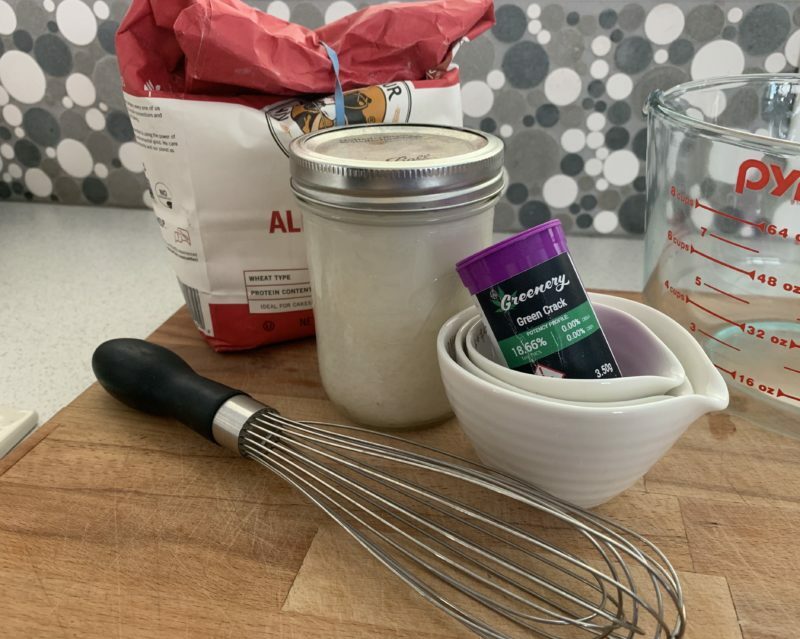 I’m not sure why I’ve waited so long to write a blog like this one because customers ask me frequently about cooking with the cannabis they buy in our Durango dispensary. Maybe it’s because we sell about seven billion different types of edibles, and it might be a bit pointless to make an edible when you can simply buy one that’s made by state-regulated professionals. But I don’t want to leave all you do-it-yourselfers in the lurch, so this week, we’re going to dive into the subject. There are two different ways to make infused edibles at home (which is perfectly legal to do so long as you live here in Colorado). The easiest way is to come into our shop and buy some oil or powdered distillate that you can mix in with your recipe, but this isn’t the method most people use because the end product isn’t technically “homemade,” so we’ll discuss the other method first: homemade infused oil or canna-butter. The biggest mistake most newbies make is to not decarboxylate their cannabis before starting this process. All the THC (the stuff that gets you high) is in its acid form in raw flower (THCa), so even if you ate the pot straight, or mixed it in with a recipe, it wouldn’t get you high. That’d be a huge waste, so, as step number one, coarsely grind your flower and then bake in on a sheet in your oven at 250 degrees for about thirty minutes. If you grind the flower too finely, it’ll add a burnt taste to your recipe, and if you cook it at too hot a temperature, you’ll degrade all the THC, which will also lead to disappointing sobriety. And if this is your first rodeo, I’d suggest starting with 7 to 14 grams of flower at most so you don’t waste a lot of weed when you mess up. It happens. Alright… now that you have some coarsely-ground, decarboxylated flower, the next step is to infuse some oil or butter so you can get that cannabis into your belly. It’s always best to use a one-to-one ratio—in other words, mix one cup of oil or butter with one cup of the decarboxylated flower. Some people go overboard with this process and try to use tons of pot, but there’s only so much THC that’ll bind with the lipids in your oil/butter, so don’t do this because it’s also a waste (wasting pot is sacrilegious). Now, as step two, take that one-to-one mixture and cook it in a pan on your stovetop for about ten minutes. This time, you’re using the heat to get the THC into the oil or butter, not to decarboxylate the THC, so it’s best to use a very low temperature; you never want your mixture to boil. And then for step three, let the mixture cool for a bit so it’s safe to handle, and then strain it through a cheesecloth into a jar; the cheesecloth will remove all the plant matter from your infused butter or oil. Boom! Now you have infused oil or butter, and all you need to do is use it instead of regular oil or butter in your favorite recipe to make a marijuana edible. Take the number of grams of flower you used to make your oil and multiply it by 1000 (all this does is convert the weight into milligrams). For the rest of this example equation, we’re going to assume you took my advice and started your first batch with seven grams, so, 7 X 1000 = 7000. Next, look at the bottle of flower you bought from us and find the THC percentage, and then convert it into a decimal. For example, if you bought some of the Sour Grape that’s on our menu as I’m typing this, the THC percentage is 20%, so the decimal equivalent is 0.20. Now, multiply the figure from step one by the figure from step two: 7000 X 0.20 = 1400. This will give you the total number of THC milligrams in your oil or butter. Next, figure out how many tablespoons of oil or butter you mixed with the flower. With 7 grams of flower, I’d recommend using two cups of oil or butter, which is 32 tablespoons. Now, divide the total number of THC milligrams from step 3 by the total number of tablespoons from step 4. So, 1400 / 32 = 43.75. This means you can assume that every tablespoon of oil/butter that you just made contains about 40mg THC. But please remember my disclaimers! This equation works well for rough estimates only because there are too many variables. Maybe you cooked the oil longer than necessary or didn’t decarboxylate the flower enough; there are all sorts of human errors that can mess up the math. So, the best bet is to always try eating a quarter tablespoon of the oil or butter you made when it’s safe to get high; if the pot you used was in that 20% THC range, a quarter tablespoon should give you about 10mg THC if you followed my instructions. And if you’re a regular consumer of edibles, you’ll know what that feels like. If not, come in and buy a 10mg single-serve cookie, eat it, and take notes as to how the high felt. It’s always best to wait an hour and a half for the full effect to kick in, and since you’re essentially doing an experiment at home, it’s always best to time that hour and a half with a clock so you can be sure of the results. And then the next day, try a quarter tablespoon of your homemade oil, time the hour and a half, take notes, and then compare your findings. Since you won’t be able to use a lab to test the potency of your oil like the pros do with recreational edibles, this method is the best one to determine the potency of your homemade infused oil or butter. Now, unfortunately, we’re not quite done with math because we need to figure out the serving size for the edible you make with your oil or butter. For example, a basic brownie recipe that uses oil calls for ¾ of a cup, which is 12 tablespoons. In this instance, I’d recommend using a half-and-half mixture of infused oil and regular oil, or 6 tablespoons of infused oil and 6 tablespoons of regular oil. With the equation we used above that determined our oil contained 40mg THC per tablespoon, it would mean that our brownie mix contains 240mg of THC (6 X 40 = 240). So, once the brownies were baked, you’d have to cut 24 equal-sized brownies to get brownies that contained 10mg THC each (240 / 10 = 24). As one last disclaimer, I’d recommend doing this entire process sober, so you don’t mess up the math. That way, you aren’t trusting “pot luck.” Get it? Alright, now onto the quickest method: simply buy some CO2 oil or Ripple from us and mix it into your recipe. For real, this method is super easy. For example, we sell bottles of Ripple for $29, and they contain 10, 10mg packs of tasteless, odorless THC distillate powder. So, if you mixed up some regular brownie mix, dumped in ten packs of Ripple, baked the brownies, and then cut out ten brownies, each one would contain 10mg THC. See? It only took me a paragraph to write instructions for this version as opposed to the 1,200 words it took me to tell you how to start from scratch. Look at the label on the syringe of oil. If you bought it from us, it’ll tell you how many milligrams of THC are contained therein. The one that’s on my desk as I write this contains 750mg of THC. So, if you were to use half of the oil in the batch of whatever you’re cooking, you’d infuse the batch with 375mg THC. So, if you used that amount of oil to make a batch of brownies, you’d want to cut it into 38 pieces to get brownies that contained 10mg THC each. But as a tip, when cooking with CO2 oil, it’s very, very important to evenly distribute the oil into the batter and mix it thoroughly. If you don’t, the oil might stay in one place, and you could end up with a couple brownies that get you way too high and a lot of brownies that don’t do anything besides taste like brownies. There. We’ve covered it all, from mixing in something premade to starting from scratch. Since this is such a popular topic, I’ll write another piece for you in a week or two because this blog is already too long—I’ll talk about cannabis dinner parties and give you a few recipes, so stay tuned. But until then, come on in with your valid I.D. proving you’re over 21 and see us at 208 Parker Avenue right here in Bodo Park. Quite a few of our budtenders know about cooking with Cannabis in Durango, so if you have any questions while you’re here, feel free to ask, because We’re Your Best Buds!